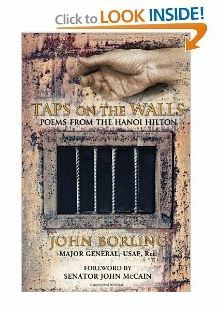 General Borling was one of several hundred POWs held in the infamous Hoa Lo Prison aka the Hanoi Hilton; an environment so cruel and hostile that it defies imagination for all but those who once resided there. During the six and a half years of his incarceration; torture, beatings, sleep deprivation, near starvation, and total lack of sanitation were a daily part of his life. It was during those days that he turned to poetry. Notice that I did not say that he began to write poetry or even read poems. Reading and writing were strictly forbidden and POWs caught with any materials for that purpose, no matter how crude, were severely punished. What he did do, however, was to create and commit to memory every poem published in Taps on the Walls, a book he wrote years after he was released from imprisonment. Furthermore, once composed and memorized, he shared those poems with fellow prisoners by tapping on the walls using a secret code. The key to this code, the use of which was also forbidden, is illustrated in the book. After several fumbling attempts to communicate using this code, I was overwhelmed by the obvious; namely, that the amount of time, patience, and persistence required to create, transmit, and decode the poems in Taps on the Walls must have been enormous. Pain and suffering has been the subject of poetry since the beginning of mankind. In particular, those unjustly imprisoned and subjected to inhumane treatment often turned to poetry to ease their mental anguish and refocus their thinking from despair to hope of survival. As for the individual poems in the book, they flow easily and steadily from one subject to the next; each fashioned in plain, everyday language without hyperbole or fancy words. The subject matter is divided more or less equally between love of his wife and family; love of flying; and his POW life —all tied together by his core values and his determination to survive. For those who have not been blessed with the experience of flying the author has included a glossary if terms most frequently used in flying in general and military flying in particular. This makes the book fascinating reading for everyone, regardless of his or her background. In summary, the words in the book fly directly from the soul of the writer and into the heart and soul of the reader, without deflection or deterrence; and in doing so, provide a powerful and much needed refresher course on American core values in terms of what they have helped us accomplish in the past, and what they can help us accomplish in the future. For that reason, Taps on the Walls should be required reading for every American who cares about his or her country. Tap on the Walls can be purchased on most online booksellers such as Amazon and Barnes and Noble,and can be downloaded to Kindle and Nook.